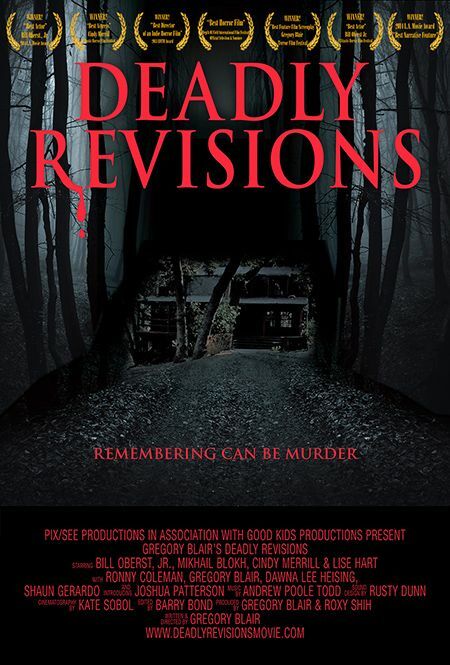 Gregory Blair’s DEADLY REVISIONS honored with Horror Society Award Nominations! Psychological thriller DEADLY REVISIONS and lead actor Bill Oberst Jr. have been recognized for excellence by Horror Society and the site is allowing fans to vote for both now through February 23rd. HOLLYWOOD, Calif. - Feb. 4, 2016 - PRLog -- DEADLY REVISIONS, Gregory Blair’s slow-burn psychological thriller and valentine to the horror genre, has been nominated for “Best Indie Horror Film” by Horror Society—one of the “go to” sites for all things horror. Also nominated is lead actor Bill Oberst Jr.
Not that Blair’s film hasn’t already picked up a handful of awards. To date, it has won the Flicker Award for “Best Picture”, the L.A. Movie Award for “Best Narrative Feature”, the EOTM Award for “Best Director of an Indie Horror Film” and the Claw Award for “Best Feature Film Screenplay”. Its lead actors have picked up laurels as well: Bill Oberst, Jr. won the L.A. Movie Award and the FANtastic Horror Film Festival Award for “Best Actor” and Cindy Merrill took “Best Actress” in the FANtastic Horror Film Festival. In DEADLY REVISIONS, Oberst, Jr. plays Grafton Torn—an amnesiac horror film writer for whom hypnotherapy and nightmares reveal terrifying images that just can’t be real. Or can they? It’s a twist-filled psychological thriller as well as a loving valentine to old-school horror with winks to horror greats, including Hitchcock, DePalma, Carpenter and others.